Like most sales professionals, I wish I had a Delorean and could crank it up to 88 MPH, just to go back in time, to make better decisions. I am proud of the fact that I’ve learnt many hard lessons only once, and I’ve used these mistakes to propel my career. When asked to write “what I wish I knew when I was 22”… I thought I would take a different spin. There are mistakes, miscalculations and maturation growth that’s been needed each year I’ve been a sales professional. I was working as a stock broker straight out of University. I didn’t understand the “10,000 hours” rule AT ALL, as I’d been in sales for a hot minute, and treated sales like it was an occasional hobby. I thought sales was a job that you just do. 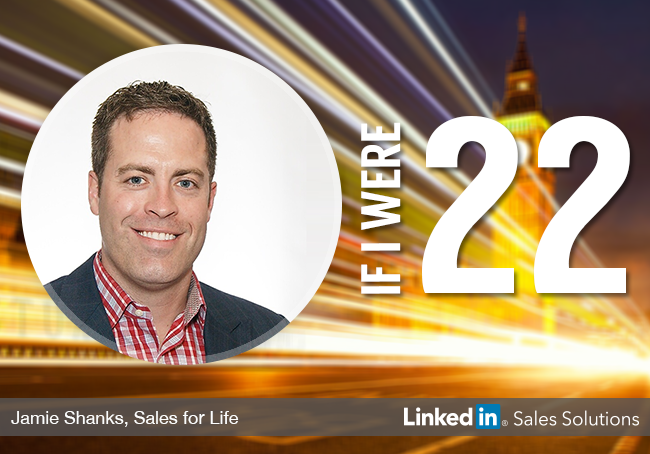 I had no idea that sales is a lifestyle, culture and needs to be part of your DNA. 23 Years Old = If you wake up wishing you were sick to skip work, QUIT YOUR JOB! It took me another year to figure this out, but I really, really didn’t enjoy my job then. The stock market collapsed (2001) and I wasn’t going to be a stock broker. I literally wished each night I could break my arm, or have the flu… so I could skip work. Lesson learned – DON’T do anything you’re not excited about doing! 24 Years Old = Not building a rock solid network! I remember my mom would say “it’s not what you know, but who you know”. In 2014, with the skyrocketing of Social Networking, that’s one of the truest statements ever. So in 2002, I left to Adelaide, Australia to do my MBA. It was an amazing 2 years! But what I learnt by doing an International MBA, and returning to Canada… your social network is key to opportunities. When I got back to Canada, I had no business network. Doing my MBA in North America could/would have built me a stronger network. I came back to Canada $60,000 in debt. I needed a job in the worst way. The mistake I made was being a cat on a string. I flipped 4 jobs in 10 months, trying to chase the shiny thing that would pay off my debt the fastest. I should have landed an opportunity and sunk my teeth into it. Any territory sales rep will tell you it takes 6 months to dig gold out of their territory. By this time, I landed at a corporate real estate company on 100% commission. I would work 8 a.m. – 8 p.m. Monday to Friday, and come in on the weekends as well. I worked harder than anyone, and it made me my first $100,000+ job at an early age. But, I look back and know I could have made the same money working smarter, and 50% the effort. I had no plan, didn’t understand time management, ideal client mix, pipeline management, basically anything about sales. All I knew is that I worked harder than anyone, and I was exceptional at lead generation (winning at the volume game). I used brute force, not intelligence. I had started to develop a reputation at the corporate real estate company as both a grinder, lead generation machine, and “garbage man”. I would work any account for both the experience and any potential pay-out. I began writing business plans to optimize the ROI. The plan was to form teams within the company that would segment roles (lead generation, account management, negotiation). While I would take less % of each deal, I could spend 10 hours a day driving leads, rather than 2. This plan was rejected, and I was demoralized. It led to me leaving the company… even after constant successful use cases. Ironically, the company moved to this model years later. 28 Years Old = Don’t chance the shiny things… again! How could I resist. A start up tech company offered me a $100,000 base salary + commission opportunity to build their business. Apparently I didn’t learn from before… you’ll forget about your paycheck quickly if you don’t love your career. To over compensate, I bought a 2004 Jaguar S-Type 4.2, which was SUPER DUMB at $900/month! I can’t believe I stuck around for 1.5 years, just to pad my bank account. Don’t do anything you don’t love; life is too short. If your alarm clock goes off, and you dread going to work… do something else. The best advice I can give an entrepreneur is “if you’re willing to make 50% less than your salaried job, and still be completely satisfied, then become a business owner.” Expect you’re doing this NOT for the money. I had a hair brained idea. I created Canada’s first zero-emissions landscaping company. My success = 200+ accounts generated in the first 2 months of operations. My failure = adding 2 partners (they were best friends of each other, not me) into the company. I didn’t understand the technology, so I brought on one partner, than stipulated we bring his friend as well. 3 decision-makers, where you’re almost guaranteed to lose every agreement is just a silly business model to be in. I sold my shares at a loss after 1 year… not a great start to the entrepreneurial world. I was now a Director of Sales at a fast growing software company. We were pioneering Sales 2.0 in Canada, testing ever technology imaginable, and driving an unbelievable lead flow. But the CEO would call me a “Demo Do’er”, just a chess piece… and I hated it. While yet again I was making great money, I didn’t know my real potential. I became amazing at my job, but my limitation was lack of attention spent on learning everything about sales… not just how to do my job. Treat sales like an investment, because I wish I had when I was 31. January 1st, 2010 I left my job as a Director of Sales, to become a “sales consultant”. Problem, I had saved 1 months’ pay, and had no plan of attack. I had landed my first client months before, but I had no plan after that client. Pure stupidity… and it almost bankrupted me by the time I was 33. I’ve only had partners as an entrepreneur. 3 failed, 1 successful. What I learnt about myself was that I’m a little nervous to go at a venture alone – but that doesn’t mean partnering, just to partner. My partnerships failed because I partnered out of necessity or circumstance, not necessarily passionate, vision and purpose. It wasn’t until the end of 2011 did I realize my calling to help sales professionals with Social Selling. A big regret of mine was not moving in that direction 12 months earlier! Because we invested most of the original Social Selling curriculum from scratch, we really didn’t believe in our value at first. I was constantly afraid that someone would turn to me at the boardroom table an call “MALARKY”! That lack of confidence, coupled with no formal training in negotiating, had me doing haircut deals just to land new clients. My regret was not believing sooner that we had created something revolutionary.